118 records – page 1 of 3. "This agreement, made in duplicate this Thirty-first / day of October in the year of Our Lord one thousand nine hundred and twenty eight / Between / George Richard Love . . . . . / AND / WILLIAM MICHAEL PARKER . . ./ And SARA MARIA PARKER . . . " printed and typed on the top of the first page. Document consists of a Land title transfer agreement between George Richard Love (No. 1365 Newcombe Street, Burnaby) and William Michael Parker and Sarah Maria Parker in relation to a portion of the southerly 12.687 acres of Block 1, of the easterly portion of District Lot 25, according to Map No. 813. 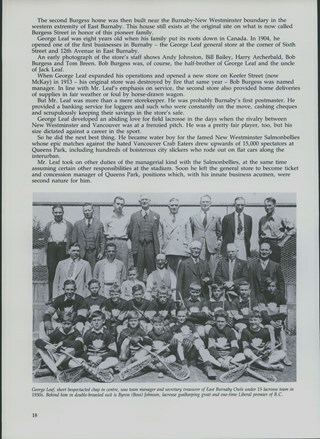 File consists of a Land title transfer agreement between George Richard Love (No. 1365 Newcombe Street, Burnaby) and William Michael Parker and Sarah Maria Parker in relation to a portion of the southerly 12.687 acres of Block 1, of the easterly portion of District Lot 25, according to Map No. 813.This document is a copy in blue ink of the the original document (BV012.31.10) but is notarized with J.J. Johnston's seal under the bottom section "FOR MAKER (INCLUDING MARRIED WOMAN)" and signed on November 7, 1928. Studio portrait with members of the Love family and William Parker inside an automobile with a fabric backdrop behind them. William M. Parker and Sarah (Love) Parker are seated in the front, George Love is standing behind and Phoebe and Esther and an unidentified man are seated in the back of the vehicle. 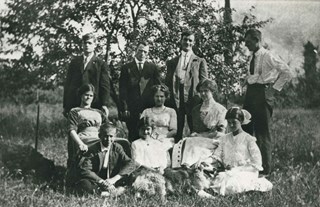 Photograph of the Love family. 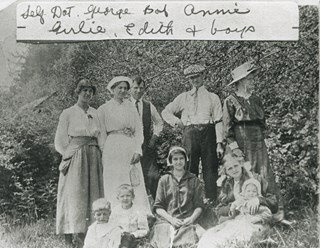 Back row, left to right: Esther Love (sister), Dot Love (sister), George Love (brother), Bob Love (brother), and Annie Love Whiting (sister). Middle: Girlie Love (sister). Front: four Whiting children, the girl may be Edith. Annie Love, the oldest of Love girls, had married Wallace Whiting. Annotation on top of photograph reads, "Self, Dot, George, Bob, Annie, Girlie, Edith & boys"
"This Indenture / made the TWENTYFOURTH day of August in the year of our / Lord one thousand and FORTY Two / . . . . / WALLACE WHITING . . . / GEORGE RICHARD LOVE . . . / HENRY LOVE . . . . . . . ./ AND / WILLIAM MICHAEL PARKER . . . / And / SARAH MARIA PARKER . . / Witnesseth, that in consideration of the sum of / ONE DOLLAR ($1.00) "printed and typed at top of document "Reg # 152828 / Dated August 24th 1942 / W. Whiting / G.R. Love / H. Love / TO W.M. Parker / S.M. 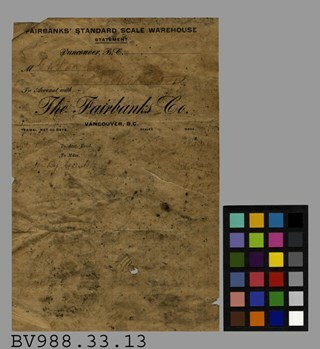 Parker / Deed of Land / Parcel " F " / Blk 1 / Lot 25 / Grp 1" printed and type written on the outside fold of document. File consists of Deed of Land title between Wallace Whiting, George Love and Henry Love and William Michael and Sarah Maria Parker re: Parcel "F: Block 1, Lot 25, Group 1. 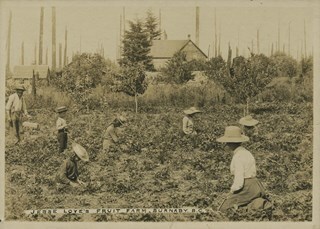 A note is pinned to the top of the document with a typed note "LAND REGISTRY / NEW WEST'R, B.C. / 1962 JUL 19 PM 2:55" indicating an application for a new copy of the title. Photograph of the Love family. 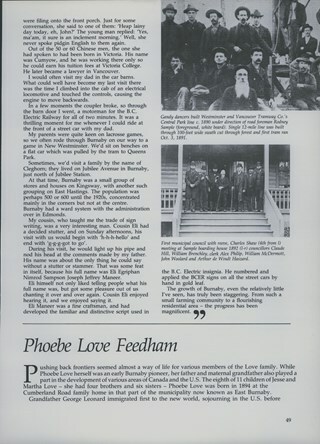 Back, left to right: Henry Love, Albert Lewis (neighbour), William Feedham (brother-in-law to be, he would marry sister, Phoebe Love), and George Love. Middle row, left to right: Sarah Love, Dot Love and Phoebe Love. Front row, left to right: Leonard Love, Girlie Love and Esther Love. The mechanics' complete library of modern rules, facts, processes, etc. 588 p. : ill. ; 15 cm. "Facts about electricity--How to make and run dynamos--All about batteries, telephones, electric railways and lighting--Engineering explained--Rules for the instruction of engineers, firemen, machinists mechanics, artisans and all craftsmen--Tables of alloy--Useful recipes--Information concerning glass, metal, wood working, leather, artificial ice-making, chemical experiments, glossary of technical terms, etc. etc." --T.p. "Compiled by Thomas F. Edison A.M., and Charles J. Westinghouse" --T.p. xii, 165 p. : ill. ; 19 cm. "with numerous engravings and plates" --T.p. 130 p.,  p. ; 19 cm. xvi, 1089-1546 : ill. ; 17 cm. "explaining in practical, concise language and by well done illustrations, diagrams, charts, graphs and pictures, principles, advances, short cuts-based on modern practice - including instructions on how to figure and calculate various jobs" --T.p. 302 p. ; 19 cm. Rhoda Lang was born in 1893 in Devon, England to William Henry Lang and Emla Wounacott. She and her first husband, Corp. Albert Edgar Exworthy had at least two children, W.A. Exworthy (William Albert / Bert) and Rosemary June Exworthy. After the death of her first husband in 1919, she married George Love in 1922. George adopted her children. Other accessioned items associated with Mr. Exworthy include: BV989.3.2, BV992.42.1, BV006.9.1, BV011.2, BV018.11.17, and BV018.11.19. 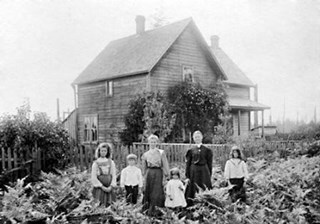 Photograph of the Love family farmhouse located at 1390 Cumberland Road (later renumbered 7651 Cumberland Street), East Burnaby. There are trees, bushes and tall grass surrounding the house.The house was built by Jesse Love with the help of George Salt in 1893. 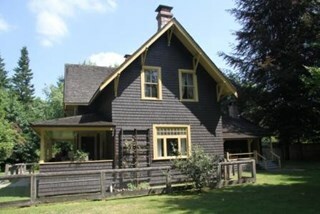 In 1988, this house was moved to the site of the Burnaby Village Museum at 6501 Deer Lake Avenue where it was restored to the 1920s era. Photographs copied from George Love and Albert Parker photograph albums. 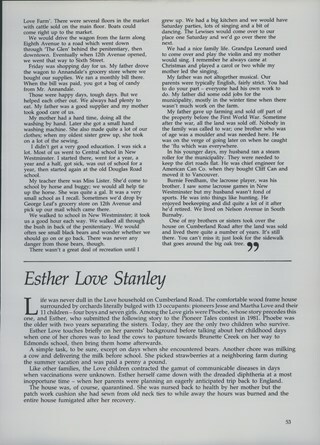 Content includes: Portraits of Richard and Elizabeth (Prince) Love; Leonard Love in uniform; south side of Love farmhouse; portrait of Love children- Esther, Leonard and Hanna; portraits of Jesse and Martha Love; studio portrait of Love children - Robert, Sarah, Phoebe, Martha (Dot) and Henry; men sitting outside Parkers home on Newcombe Road; portrait of Sarah, William and Albert Parker; front of Love house in winter; Jesse, Martha and two girls in front of house; side of Love farmhouse with kitchen porch and car outside; Parkers at tennis court; baby in walker in Love farmhouse kitchen; baby on chair/couch in Love farmhouse kitchen; exterior of Love farmhouse before kitchen was added; Jesse Love spraying trees; William Parker with shovel in front of barn; Parkers building a pond; Love farmhouse in winter with icicles; Sarah Parker (nee Love); William Parker outside; a woman feeding chickens. 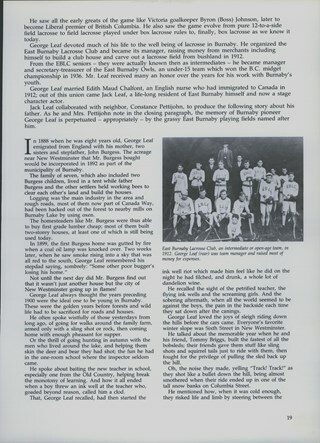 File consists of copies of biographical and vital statistic information and an obituary about George Leonard. George Leonard was the father of Martha Love who married Jesse Love. Photograph of a Love family reunion dinner at the Mark Twain Restaurant. 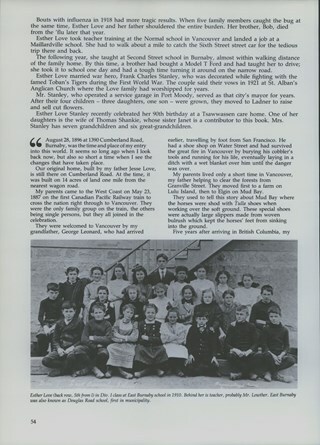 George and Mary MacKenzie are identified in the left corner of the photograph and Bert and June Exworthy are identified seated across from them on the right. 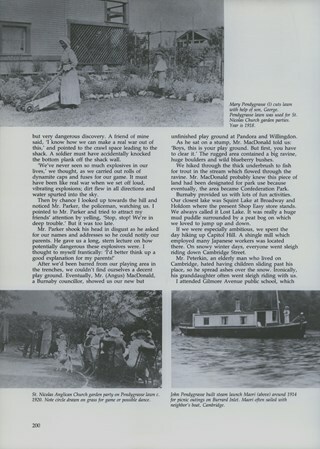 Photocopy of photograph with notes in pencil accompanies photograph. Notes read from left to right: "George Mackenzie / May / Mackenzie / Bert Exworthy / June Exworthy"
Photograph of a Love family reunion dinner. 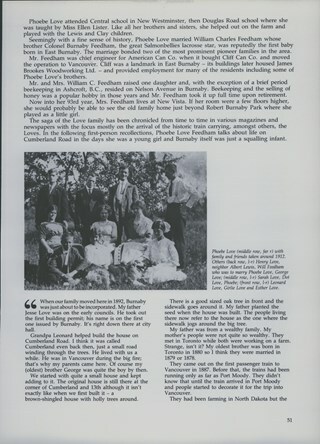 Senior members of the Love family are identified from left to right as: Les Barnes, May and Bill Parker, Bert and June Exworthy, George and May MacKenzie, Mrs. Dave McKenzie and Dave McKenzie, Bob Chamberlain (husband of Anne), Ramsey Shankey and Anne Chamberlain (daughter of Minnie and Angus MacKenzie). Photocopy of photograph accompanies photograph. There are no notes. 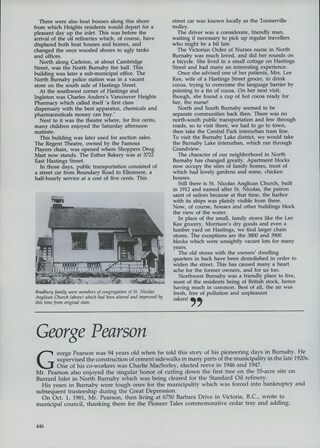 File consists of a one page double sided handwritten document on a ledger page titled "George Leonard Estate (Deceased)" with a list of expenditures and receipts for the estate of George Leonard, deceased 9 April 1909. "McLellan, Savage / & White / Barristers __ / 337 Hastings St W." hand written on outside fold of document. George G. Harrap & Company Ltd.